What the blurb says: “After an op in Istanbul goes sour, all Alexandra Poe wants is a little down time, and a chance to finally sell off the family vacation home in Key Largo which carries too many painful memories. This second book in the Alexandra Poe thriller series is actually the first one I’ve read. The series is a collaboration written by two authors already well known in the genre – Brett Battles (Barry Award winning author, founder member of Killer Year, and member of International Thriller Writers and Mystery Writers of America) and Robert Gregory Browne (AMPAS Nicholl Fellowship-winning screenwriter and ITW Thriller Award-nominated novelist). It’s an action-paced, fast paced, adrenalin-rush of a read from the opening chapter to the last. Alexandra Poe is a skilled and smart operative, hunting her mark and adapting her plans as problems threaten the mission. She’s used to being in control, but on this job something is different – her focus is off, the conflict she’s feeling over an offer on her parents’ beach house is preying on her mind. Then people from her personal life start showing up in the most unexpected, and dangerous, locations. It seems that the job on the beautiful Bahamian island isn’t all that she and the team believed it to be. As the bodycount rises, and danger closes in, Alexandra has to figure out who she can really trust, because one wrong move and her and her team won’t be making it off the island alive. I devoured this book in a weekend. 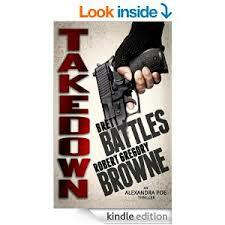 It’s a fun and lively read, and a must for all those who enjoy a fast-paced action thriller.